Those seeking enlightenment should not ignore the importance of such learning . . .
“While demonstrating some of the extraordinary signs of his realization near the Mahabodhi Stupa in Bodhgaya, an old lady asked him, “Who is your teacher? To which lineage do you belong?” Guru Rinpoche replied, “I have no teacher and no need of one. Neither do I belong to any particular lineage. I am a totally enlightened being, primordially aware.” The old woman immediately responded by saying, “Oh, that’s not right. Without the blessings of a teacher, you cannot be enlightened. You must have a connection with a master. Lacking that, no one will accept your words.” He quickly understood the importance of the old woman’s statement in relation to making the teaching available to others. As a result, to demonstrate the supreme means of approaching the Dharma, Loden Chokse began to seek out lineage masters and followed the teachings according to their instructions. This indicates that even if you are already a highly enlightened being, it’s still necessary to have lineage connections. In order to emphasize and communicate this truth, Guru Loden Chokse worked to contact many great masters and receive their teachings. In ancient times, there was a traditional curriculum known as the “ten sciences.” One had to be knowledgeable in all these fields of study to be considered an educated person. The five major sciences are (1) language, (2) medicine, (3) logic, (4) applied sciences, including architecture, geometry, and chemistry, and (5) the study of mind, or philosophy. The five minor sciences are (1) poetry, (2) rhetoric, (3) synonyms, (4) theater, and (5) astrology. 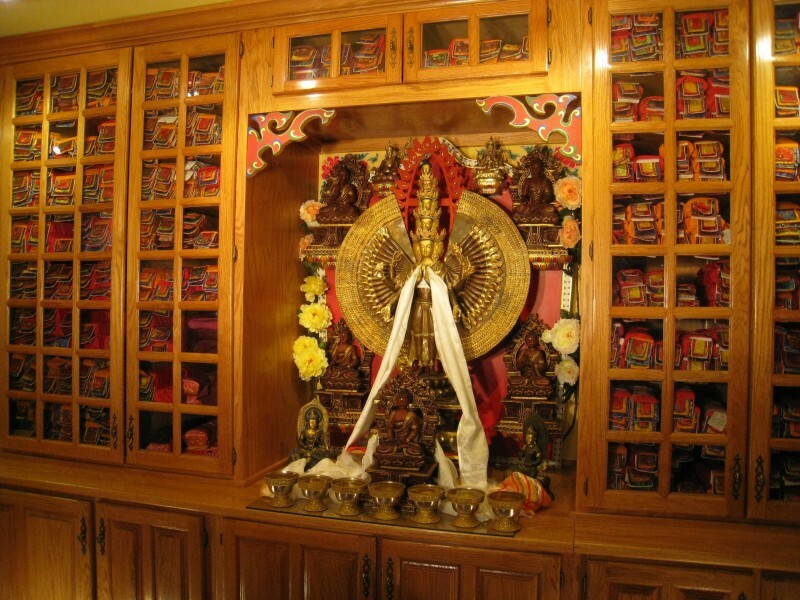 Photo of the Chenrezig Shrine in the Shantarakshita Library at Padma Samye Ling. We should always remember that bodhichitta is our ground. We should bring everyone together equally within our love and compassion, without discrimination.